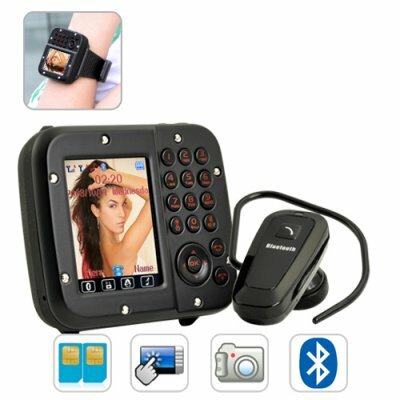 Successfully Added Penthouse - Cell Phone Watch (Quad Band, Dual SIM) to your Shopping Cart. Introducing the world's smallest super cell phone, the Penthouse. Merging all the functions of modern cell phones into a unique and highly compact form, the Penthouse has everything you ever wanted from a phone for only a fraction of the price and size. Complete Multimedia Center: Camera, image viewer, video recorder, video player, audio player, sound recorder, FM radio... with all this available, Penthouse seems more like a digital camcorder that you can make calls with. Bluetooth: Connect to your favorite Bluetooth accessory, like your Bluetooth Car Kit or Bluetooth Bracelet. Also includes a free Bluetooth earset for handsfree communications. PDA Tools: Calendar, To Do, Alarm, Calculator, Stopwatch... let your day go smoother with all of the Penthouse's useful tools at your side. Stylish Watch Phone: Simply attach the watch strap and the world's smallest cell phone turns into an amazing watch phone. When you're done showing it off to everyone, just remove the strap and you are back to holding the Penthouse, the world's coolest Cell Phone Watch! Available in our warehouse now, order today and we'll express ship it out tomorrow. Brought to you by the leader in Tech Gadgets and Wholesale Electronics - Chinavasion. Detachable face - from watch phone to mini cell phone! Free 1GB micro SD card! How can I access the micro SD card? The microSD card sits next to the SIM card both of which are accessible by removing the battery. What cool things can I do with this watch phone? For our DIY experts, you can connect this to a necklace and wear around your neck! Better yet, hook it up to your keychain!